If you ever wondered if your dog is still a rebellious teenager or a respectable pensioner, this dog age calculator might be right up your alley. It is a tool that lets you recalculate dog years into human years for any dog breed. (Spoiler alert: a year in your buddy's life is not equivalent to seven human years.) Thanks to this calculator, you will learn how to count dog years in no time! More fond of felines? In this case, check out the cat age calculator! Unfortunately, there is no one simple formula to allow you to quickly convert between dog and human years. Puppies grow up faster when they're still young, and they age slower once they reach maturity. Hence, the first year in a dog's life is always equivalent to 15 human years, but for older dogs, one year is only like 4 or 5 human years. Our dog age calculator takes into account only dogs below 20. We know that older dogs have made the Guinness World Records, but they were exceptions - regular dogs don't live that long. Begin by researching your puppy's breed. If it's a mongrel, you don't need to know the exact breed, but you should know how big will the dog grow. Choose whether your dog is small, medium, or large. Choose the appropriate type from the list. Enter the current or expected age into the dog age calculator. You will obtain a result - the number of human years that correspond to your dog's age. Think about a control visit at your doctor. How often do you go to get yourself examined? Every two years? First two years of a dog's life are like 24 human years. Can you imagine going to see a doctor only once during that time? Remember to take your dog to a veterinarian much more frequently than you go to a doctor. Twice a year is an absolute minimum! Like walking your puppy? Take a look at the walking calorie calculator to find out how many calories you burn in the meantime! 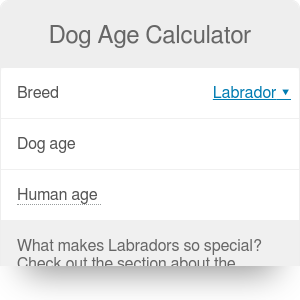 Dog Age Calculator can be embedded on your website to enrich the content you wrote and make it easier for your visitors to understand your message.